This is a Handaxe made of banded ironstone, Kathu Pan, McGregor Museum, Kimberley. — Photo (©/2011/09/SAfrica-Acheul.jpgMichael Cope). 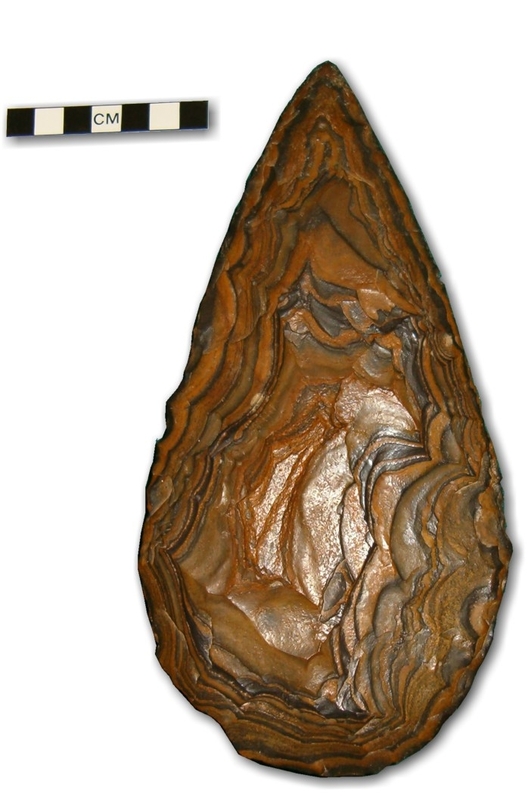 This Handaxe was found embedded in an exposed stratigraphic sequence in a sinkhole at Kathu Pan in the Northern Cape, South Africa, and dated by association with tooth-plates of the extinct Elephas Reckii to approximately 750 k.a. BP. This post was stimulated by the comments of Michael Cope. Showing this Biface is an exception from the rule of only displaying artifacts from my own collection. Considerable progress has been made in the excavation and dating of Paleolithic sites in Southern Africa during the decades after the Klasies River project. Handaxes and cleavers have their first appearance nearly synchronous with the earliest appearance of Homo ergaster at ca. 1.8 myr BP. The production of these artifacts (Large cutting tools, LCTs) can be seen as the expression of a deliberate choice of early humans for a standardized design of artifacts. I have discussed the cognitive and/or cultural significance of such a design and the variability in the outline shape of LCTs in some earlier posts. Hot debates have arisen especially about the cognitive significance of bilateral symmetry and the supposed presence or absence of “mental templates”. In The East African Background: LCTs have a considerable age and are older than the Acheulian anywhere in the World. At Kokiselei 4, an archaeological site from the Nachukui formation (West Turkana, Kenya) early Acheulian tools have been securely dated back to 1.76 myr ago. The dates of several sites between 1.8 and 1,4 Mya BP are controversial (e.g. Peninj; Tanzania at 1.7–1.3 Mya). On the other hand the Acheulian at Konso-Gardula; Ethiopia and the Site EF-HR in the upper part of middle Bed II at Olduvai Gorge in Tanzania are unequivocal 1.4 Mya old. South African Acheulian: Well-dated Acheulian sites are still few and there are difficulties of dating caves and river sequences, where much of this material is preserved. Except from the Gauteng area- absolute dates for the South African Acheulian- reported below are rather insecure and age estimates may rapidly change in the future. The most proliferative Acheulian deposits in South Africa are the cave sites within the Gauteng area (e.g., Sterkfontein, Swartkrans, and Kromdraai, dated to 1,4–1,1 Ma). The sequences of the Free State (e.g., Vereeniging and Cornelia are currently dated to 1,1- 0,8. Ma, the Vaal River sites (e.g., Pneil and Canteen Kopje) are said to be 1,4- 1,2 Ma old and the series of Pan deposits around Kimberley may be of early Middle Pleistocene age (e.g., Kathu Pan at ca. 750 k.a. BP and Rooidam). Several dune sequences of the western Cape coast (e.g., Elandsfontein may be dated as early as 1,1- 0,8 Ma and Duinefontein II > 800 k.a. according to the faunal remains). The series of isolated caves occurring throughout the country (e.g., Wonderwerk Cave in Northern Cape (maybe 1,1 Ma?) the Cave of Hearths (Bed I-III) in Limpopo Province ca 670–560 k.a. Other localities were detected at Amanzi Springs (Eastern Cape) and in the Mapangubwe National Park along the Limpopo River (Limpopo Province). Victoria West: Prepared giant core technology (Victoria West technology) has been recovered from a stratified Acheulian in stratum 2a at Canteen Koppie. The stratum 2a contains an Acheulian assemblage that is overlain by Fauresmith material in stratum 1 , where it is then followed by an MSA which has dates of 120–80 ka. The Victoria West technology therefore appears to be associated with terminal Acheulian artifacts and is older than the Fauresmith complex. If the age estimates for a similar industry at Kathu Pan are extrapolated, then stratum 2a at Canteen Koppie should be older than 540–470 k.a. and according new dating programs even 1 Ma old. For sure Victoria West cores are much older than the first appearance of the Levallois-technology in Africa and Europe at 400-300 k.a. BP. ESA–MSA transition: The timing and character of the ESA–MSA transition in Southern Africa is as yet unclear. New data from stratified Fauresmith sites suggest that this industry, which combines small refined handaxes with technological components characteristic of the MSA (prepared cores, blades, Levallois points, convex scrapers), maybe as old as 542–435 k.a. (Wonderwerk Cave MU4 , Kathu Pan 1). The presence of blade tools and prepared core technology in deposits dated to >400 k.a. at Kathu Pan 1 is of considerable interest, because it would fit to the MSA chronology in East Africa. Blade tools co-occur with Acheulian bifaces, Levallois flakes and points at the site of LHA/GnJh-03 in the Kapthurin Formation (Kenya) dated to 545-509 k.a. , preceding anatomical modernity in hominins, point to a „long MSA chronology“ in Africa. In South Africá finally, typical MSA- ensembles, lacking the presence of handaxes, appeared at roughly between 300 and 250 k.a. BP (Florisbad and Sterkfontein-Lincoln Cave). The Kathu Pan MSA at 336–254 ka is potentially slightly older, if we accept this date.